Is the Music Industry Going the Way of the Newspaper Industry? The newspaper industry has had to grapple with a seismic shift in user behaviour over the last 15 years: people just aren’t buying newspapers in the numbers they used to and crucially newspaper buyers are getting older, to the extent that the long term prognosis is for the bulk of newspaper buyers to die off….literally. The irony (in a cosmic irony Alanis Morissette-type usage of the word rather than literal irony) is that more people are consuming more news than ever before, and young people too. But most of that consumption is online and free. What newspapers haven’t yet figured out is how to turn this into a business, and all the while (to mix my clichéd metaphors) watching their cash cow whither on the vine. The reason for this potted history of the 21st century newspaper industry is that it is looking increasingly the case that the music industry is arriving at a worryingly similar place. Another year of digital stasis. With 2011 sales figures beginning to come in, the scale of digital music’s recent underperformance is becoming increasingly clear. In the UK overall music sales continued to decline with digital some way off yet from being able to pick up the slack. The UK’s record label trade body the BPI reported that digital growth wasn’t enough to prevent a 5.4% decline in total album sales. The picture was more positive in the US with Nielsen reporting that album sales actually grew for the first time since 2004, up 1.3% on last year. But the US and UK numbers aren’t quite all they seem. Both the BPI’s and Nielsen’s numbers are for unit sales. One of the consumer benefits of the music industry meltdown has been aggressive discounting, with labels and retailers having to slash prices to persuade us to buy in numbers. While this is great for music fans it means weaker profits for labels and that revenue sales trends are weaker than volume trends. And that means that the UK revenue decline will likely be worse than 5.4% and that US revenues may well be down on 2011 despite the positive performance in units terms. With a decade of digital sales already behind us this is the stage where digital sales growth should be rocketing and lifting the whole market with it. The continued dominance of the CD. Albums are by far the most valuable component of music sales and despite positive digital growth the album remains largely unaffected by digital. 76% of album sales in UK are CDs and in the US the rate rises to a whopping 82%. When the CD hurts the music industry hurts. Nearly half of the growth in US albums sales came from increased CD sales. Perhaps even more concerning is that three quarters of all US albums sales are offline. Thus the music industry is depending on non-net-savvy consumers who don’t even buy online for the lion’s share of their income. And CD buyers aren’t spring chickens either: nearly 40% of them are over 45. On either count that is not exactly future-proofed revenue. The echoes of the aging newspaper audience are depressingly obvious. The CD: the Music Industry’s Heroin (and not in the female hero sense of the word). Another similarity between the newspapers and record labels is their addiction to their respective dying formats. The direct consequence of poorly performing digital revenue strategies is that physical revenues become all the more important which in turn makes labels and newspapers less willing to pursue ambitious digital strategies that might hurt physical sales. Which of course results in digital sales underperforming further and the whole thought process starts again. This circular logic begets strategic paralysis. Unless the record labels learn how to kick their CD habit they’re going to find themselves presiding over perennial long term decline. The danger of ‘the Adele Effect’. Both the UK and US sales numbers were dominated by Adele, with her landmark album ‘21’ topping charts in both markets and selling over 13 million copies (becoming the biggest selling album in a single year in the UK). Uniquely well-performing albums like ‘21’ have a habit of creating reality distortion fields. As I explained in a previous post Adele, along with Coldplay, is an increasingly rare breed: an album artist. Adele and Coldplay both appeal to the older album buyer (which is exactly why Coldplay won’t let ‘Mylo Xyloto’ go on Spotify until sales have peaked). The strong performance of both these artists’ albums in 2011 has helped boost albums sales, but more importantly they lend a veneer of vitality to the album market that is not accurate. More typically 21st century artists – the likes of Pitbull, Rihannna, Katy Perry and LMFAO – will be measuring their 2011 success in terms of singles sales, live sales, merchandize revenue, YouTube views and Facebook likes. Rumours of the CDs’s demise are much exaggerated…perhaps. Of course the album is far from dead – after all, as we have seen, the CD remains the bedrock of music sales – but it is becoming just one, weakening, part of a broader mix of artist revenues. In some ways artists are better protected from the music industry meltdown than record labels: they – along with their managers – are rapidly acquiring new skillsets and business acumen. Record labels however are left having to put a positive spin on the album’s apparent longevity. 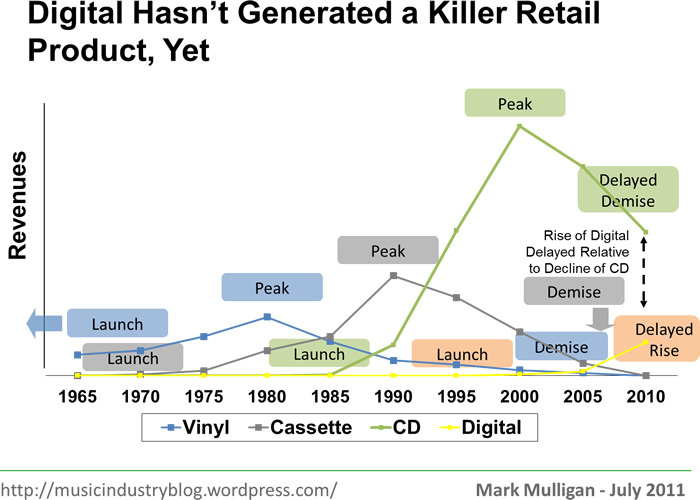 However the fundamental fact remains that the CD is a dying breed. It may have a good few years left in it yet, but the long term prognosis is terminal. Innovate, innovate, innovate! Newspapers and record labels are both at a crucial juncture: physical format revenues will continue to pay the bills for the coming years but paradoxically they must pursue radical format and product innovation strategies that will actually hasten the demise of those same physical revenues. If they don’t, record labels and newspapers will find themselves with the lose-lose scenario of depleted physical revenues and pitiful digital income. Next week I’ll be publishing a free report that lays out the vision for exactly what that format and product innovation needs to look like. Today Omnifone made the move from B2B2C music service provider to consumer facing brand with the launch of their streaming music service Rara, which is being operated as an entirely separate company utilising Omnifone’s technology infrastructure. The knee jerk reaction would be that this is bandwagon jumping in an increasingly cluttered streaming market, joining the likes of Spotify, Deezer, We7 and Juke. But the folks at Omnifone have been in this business long enough to not simply pursue a me-too strategy. Indeed differentiation is at the heart of the Rara strategy. Regular readers of this blog will know I have long argued that the paid digital music market is stagnating because it hasn’t got the tools to reach beyond the tech savvy music aficionado base it has addressed so far (mainly through iTunes). Spotify’s recent US-and-Facebook -spurred growth has been encouraging but we are still talking about single millions of premium subscribers globally, most of whom are the same aficionado segment all other services have been chasing for the last 10+ years. If digital music is ever going to break out of the confines of the few per cent of consumers per market that will pay for those services a new go-to-market strategy is required, as is a new series of music products. This is where Rara come in. They’re not bringing the new product (it will be years before anyone gets the licenses for the required next generation products from the record labels) but they are bringing a new approach to customer acquisition and a new approach to user experience. Changing the funnel. Spotify (with whom most people will rightly or wrongly benchmark Rara) use their free ad supported tier as their customer acquisition funnel. 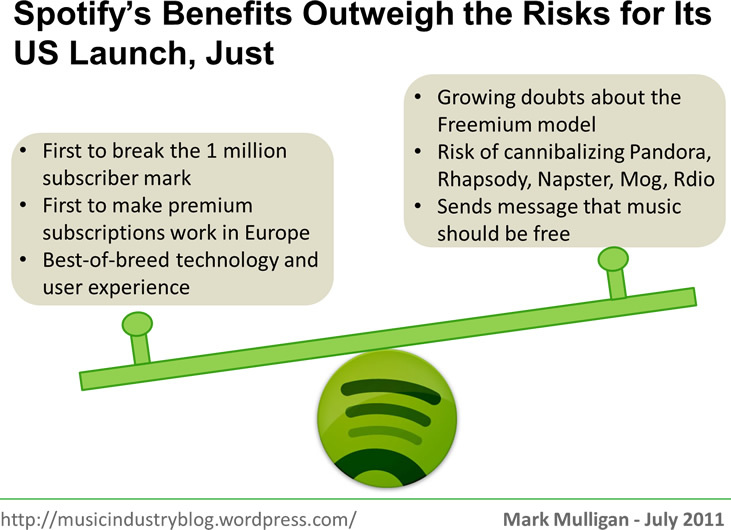 The losses associated with supporting free Spotify users is their customer acquisition cost. Rara’s funnel though is a combination of traditional marketing tactics (which will be backed by substantial marketing spend) and an innovative pricing strategy. Taking a leaf out of some magazine subscription models, Rara gives consumers an introductory 3 month price of 99p / 99c which automatically switches to the full rate at the end of the period. If this approach works, it will enable Rara to separate the wheat from the chaff, with prospective valuable customers self-selecting by submitting their payment details to get access to the heavily discounted rate. The conversion rate for these consumers should be much higher than for ad supported free users (many of whom sign up simply to get free music). Changing the experience. Digital music services and players are notorious for looking more like accountancy software than they do music software. The ‘music collection as excel spreadsheet’ is a paradigm we have all grown used to. But there in lies the rub. Most of you reading this will be savvy users who have grown to tolerate a series of inherently poor user experiences. For the digital hold outs this just serves as another reason not to go digital. Rara takes a different approach, giving users a highly visual experience, with colourful graphics and mood-based playlists at the core of the service. Of course you can still dive into the excel spreadsheets but you can quite easily never need to. Rara’s approach is not a radical departure, rather a series of welcome innovations on the current model. Critics will argue that it is ‘just another streaming service’. But streaming is the delivery vehicle for the experience rather than the product itself. Think of streaming like cable TV infrastructure, and services like Rara, Spotify and Deezer as the cable companies that package channels over them. Rara isn’t *the* answer to the music industry’s woes. No single service is. But with a fair wind, it could well become an important part of the answer. The music industry desperately needs the mass market brought into the digital fold. It needs more fresh thinking like Rara’s to help achieve that. Today Blackberry announced their anticipated BBM Music service, which it transpires is powered by white label cloud music stalwart Omnifone (who also power the likes of Sony and Vodafone). Blackberry have done something with BBM Music that many other services haven’t: they have targeted a specific defined consumer segment. Which in turn is something that the majors, Universal in particular, are increasingly looking for in music services they license to. Blackberry has weathered a lot of tough marketplace scrutiny over recent years with many questioning how RIM will deal with the iPhone threat. Those concerns are valid ones but primarily relate to the email-focused business users and misses the massive importance of the youth segment to Blackberry adoption. Blackberry’s youth appeal largely stems from BBM presenting a cost-free alternative to texting for text hungry youths. Blackberry’s ability to successfully simultaneously target these two almost diametrically opposed segments with the same device portfolio has been little short of masterful. This was well illustrated to me when a friend recently told me about when his teenage daughter saw him checking email on his Blackberry she asked him “what do you need a Blackberry for Dad? Aren’t you too old for one?”! So by targeting their youth centric installed base of 45 million BBM users with a cheap, inherently viral and social music service plays to one of Blackberry’s key strengths. Of course direct comparisons with Rhapsody, MOG, rdio, iTunes, Spotify etc are unlikely to be unfavourable, but that’s simply not what BBM Music is about. We’ve reached the stage of maturity in digital music where we shouldn’t be talking anymore about ‘an iTunes killer’ or a ‘Spotify killer’. Instead the music industry needs targeted segmented offerings that grow the market by engaging with un-penetrated consumer segments. In that context, BBM Music should be a valuable addition to a digital music marketplace that is in real need of new differentiated services. Finally….the timing of the announcement, off the back of BBM’s new found infamy as the communication method of choice for London’s rioters is unfortunate but does open up some interesting potential marketing slogans, such as ‘download while you loot’ and ‘so cheap it’s a steal’…. And if you missed it, don’t forget to submit an email subscription to this blog to get a freecopy of my latest report: ‘Agile Music: Music Formats and Artist Creativity in the Age of Music Mass Customization’. See here for more details. I want to spend the next few minutes building the case that digital music is in a period of transition, a stage that presents us with a unique and ever narrowing window of opportunity to drive truly transformational change within the music industry. The fact that this panel focuses on both retailing and licensing is emblematic of the convergence, nay collision, of product models and business models. Collisions that help explain the current turmoil the music industry faces and in which the foundations for future growth lie. So what exactly has gone wrong? Firstly, digital retailing is looking increasingly unfit for purpose. It has failed in its key objectives, included in which is a failure to generate a format succession cycle. With the cases of the cassette and the CD, these formats were firmly in the ascendency by the time their predecessors were in terminal decline, and they then went on to drive periods of unprecedented prosperity. The same though patently does not apply to the paid download. However if you swapped out paid downloads for MP3s then the line would be off the chart. Consumer demand is not the problem. 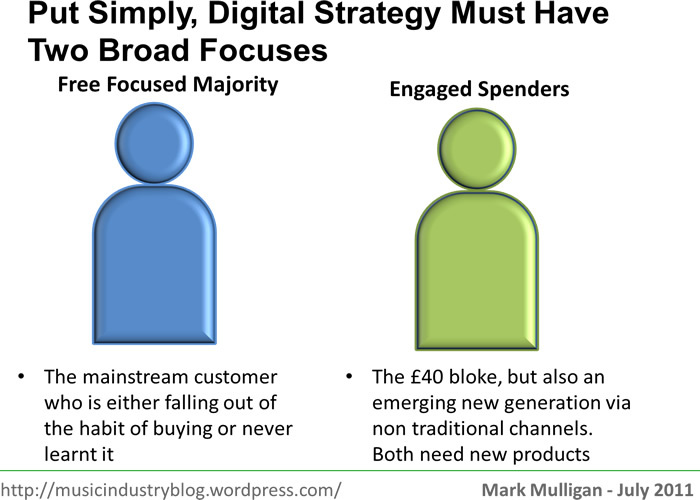 Current digital retailing formats failing to meet consumer demand is. And of course Apple’s closed iTunes ecosystem plays a massive role here too. And if you look at the licensing side of the equation we have problems there too. 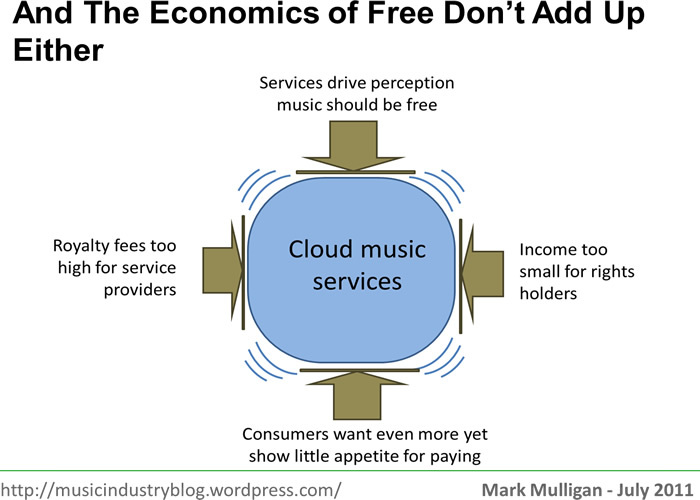 Rights owners and artists both feel they don’t get enough from Freemium cloud services, and yet the services themselves feel that they pay too much to those very same parties to be financially sustainable. With cracks appearing right across the value chain it is looking increasingly like there are too few levers left to pull to fix the model. Now as concerning as all this may be it doesn’t mean the end of the music industry, nothing like that in fact. Instead it is simply the end of the beginning: the end of the first chapter in the digital music business. What we have now are transition products that did a great job of starting us on the path out of the analogue era but their usefulness is drawing to a close. The paid download is a sustaining innovation. For those of you not familiar with Clayton Christensen’s ‘Innovator’s Dilemma’ this refers to the principle that companies essentially have two ways to innovate their products. The first is that they can play the safe game where they tweak features and pricing to defend market share and revenue growth. These are sustaining innovations. Or they can take a gamble with disruptive innovations that have huge potential but also massive risk and can even shatter their existing business models. Unsurprisingly most incumbent companies opt for the safe bet. But the safe bet is often anything but safe, as it leaves an innovation vacuum which is swiftly filled by the competition, or in the case of music, by the illegal sector. 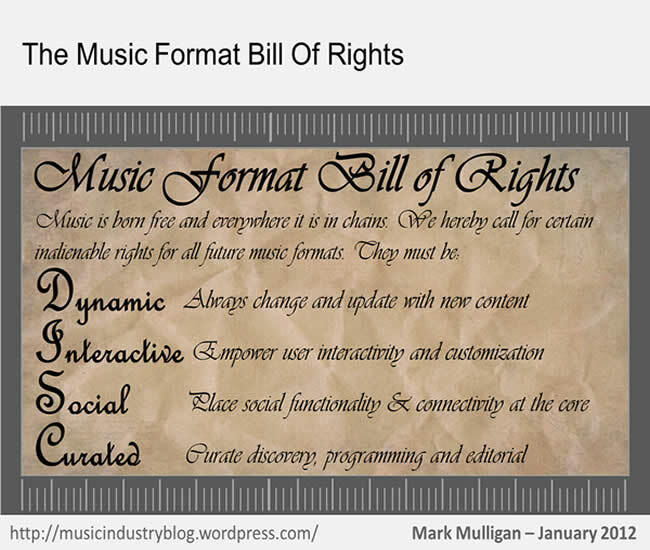 File sharing was the disruptive and transformational innovation of digital music, not the paid download. 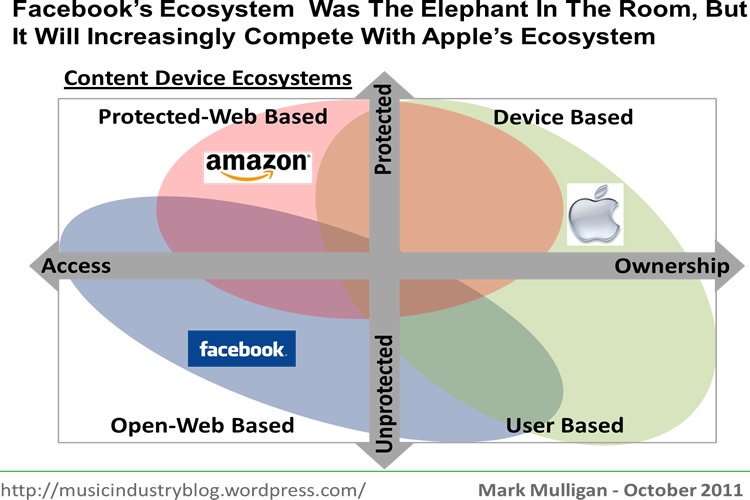 Added to this, innovation has been too heavily focused on business models and not enough on user experience. 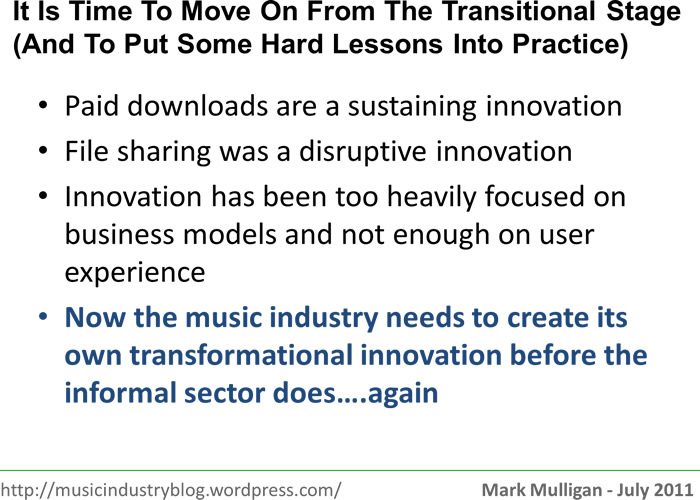 Now the music industry needs to create its own transformational innovation, putting user experience to the fore, before the informal sector does so….again. So how do we get out of this situation? Here’s my uber edited solution: two segments and three monetization models. Forget for a moment the complex multi variant segmentation schemes you’ve painstakingly constructed. Think instead of consumers as those who will pay and those who won’t. On the free side we have those consumers who are falling out of the habit of buying CDs and either haven’t discovered digital alternatives yet, or if they have they are perfectly happy with free services such as Pandora, Spotify, We7 and of course their killer app: YouTube. Here also are all those pesky freeloading pirates – they’re not lost customers, but they’re probably not about to start paying 9.99 a month for Spotify Premium either. And on the other side we have the highly engaged music aficionados. This used to just be the ‘50 quid bloke‘ but sites like Pledge Music are creating a new generation of younger music fans who will pay good money for recorded music when they establish a direct relationship with artists. 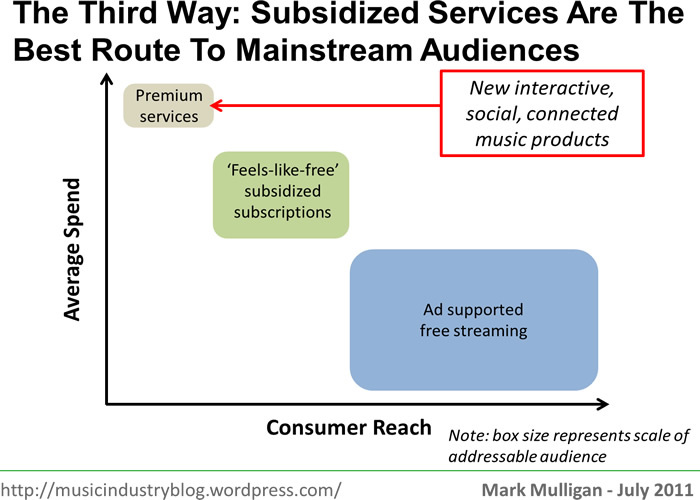 The way to monetize these three groups is threefold: at the bottom of the hierarchy are ad supported free services for the passive majority and the freeloaders, where the contagion of free is legion; at the top there are premium services for the much smaller numbers of engaged aficionados (but they need an entire new generation of music products that are interactive, social and connected, a true successor to the CD – if all they have to chose from is 9.99 a month streaming rentals then this segment will dwindle to the few percentage points of consumers who actually pay those services); and in the middle we have the best balance of scale and ARPU, with subsidized services where third parties such as telcos and car manufacturers pick up some or all of the wholesale cost to make music feel-like-free or close-to-free for end users. This is the monetization model which will pull in many of those who won’t pay and also those who are in danger of falling out of the habit of paying. So there you have it: 2 segments + 3 monetization models = the foundation for a prosperous music industry in 2012 and beyond.